When I was little, my mom used to make us homemade donuts. 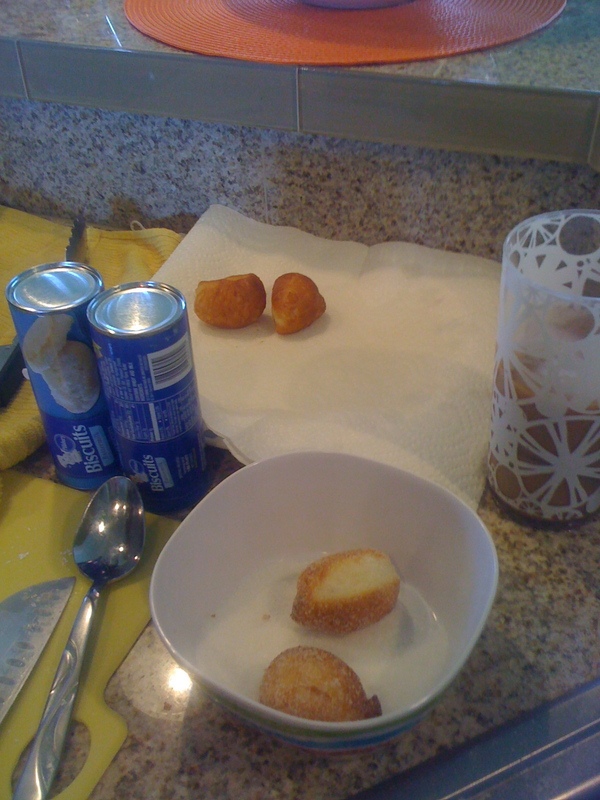 She would pop open a can of biscuits, use her perfect donut hole cutter, fry up the donuts and the donut holes, roll them in powdered sugar, and voila! 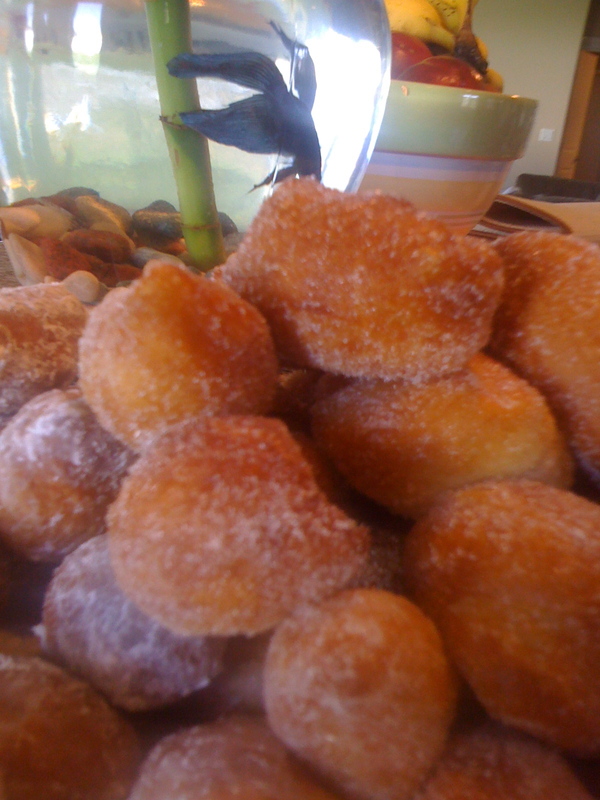 homemade donuts. One of my favorite breakfasts. However, I have never made them. 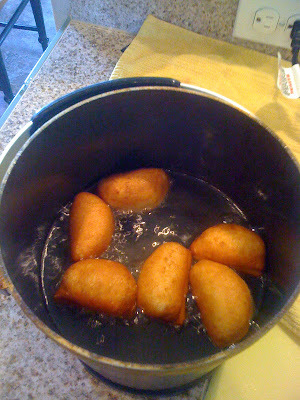 I don't have the perfect donut hole cutter, and I would be sad because the donut holes were my favorite part of homemade donuts. So, years and years later, I'm on a walk with a friend of mine who tells me that her husband cuts biscuits in quarters and fries them up and rolls them in sugar. (Cue the clouds parting and angels singing here.) What a revelation. Not only do I not need the perfect donut hole cutter, but I don't even have to make traditionally shaped donuts. Get ready for it: They can ALL be donut holes! So here you go, my super technical, exceptionally difficult donut recipe! Trust me, you're going to love it. Pop open the can of biscuits and cut each biscuit into as many pieces as you like. For "donut holes" cut them into fourths, but be ready to get tired of flipping each piece pretty quick. These are cut into halves. (Also delicious.) 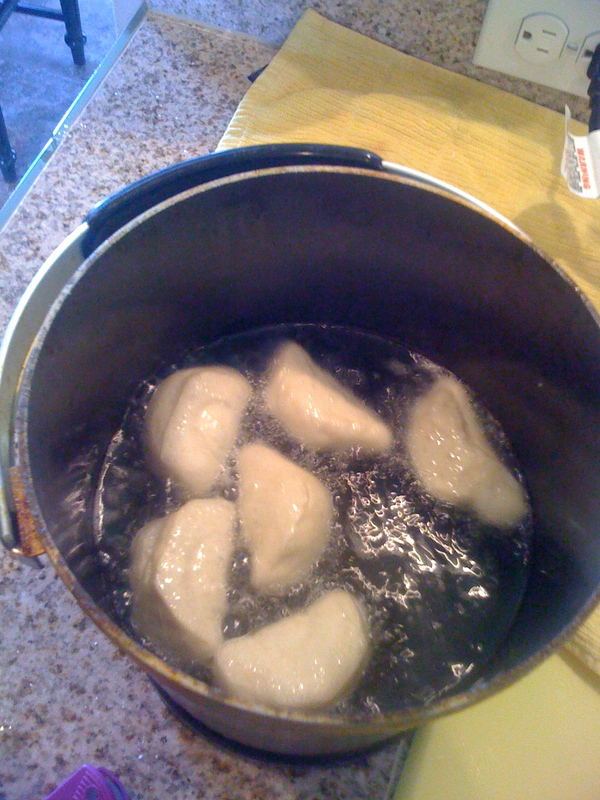 Fry them until brownish on bottom (don't worry you can see it browning up the sides too...) then flip them and fry until brownish on the other bottom. Remove from oil and drain for a few seconds on paper towels. If you happen to be drinking cold coffee made by a friend as I was, then all the better for your cooking experience. Then, toss them into a bowl of powdered sugar or regular sugar. Or half in powdered and half in regular sugar and then there's a choice and suddenly breakfast is fancier. Artfully arrange on a plate. (by that I mean stack as many as you can...) And serve. Or... pause for a moment to take a pensive photo with the fish. Seriously, you're going to love these things. You should probably try them today. Or tomorrow. The next day at the latest, but that's only because you may need to go to the store to get biscuits.